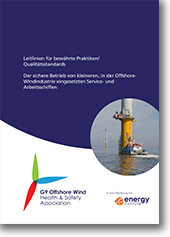 This is the German translation of the publication Good practice guideline - The safe management of small service vessels used in the offshore wind industry. The English version of this title has been updated to a second edition in 2018 and can be downloaded for free here. The G9 Offshore Wind Health & Safety Association (G9) has commissioned the development of this good practice guideline on the safe management of small service vessels used in the offshore wind industry. The guideline draws upon existing standards and practices in the maritime industry and offshore oil and gas sector, while seeking to take account of and reflect the unique aspects of working in the offshore wind industry. This guideline represents the first step within the G9 to reduce the HSE risk in this sector of the industry. Following publication of the guideline, the G9 members will work closely with other key stakeholders within the offshore wind industry to implement the key principles and recommendations in this guideline, in order to reduce the number of incidents resulting in injury to personnel.